10 Side Dishes That CROCK! - Recipes That Crock! 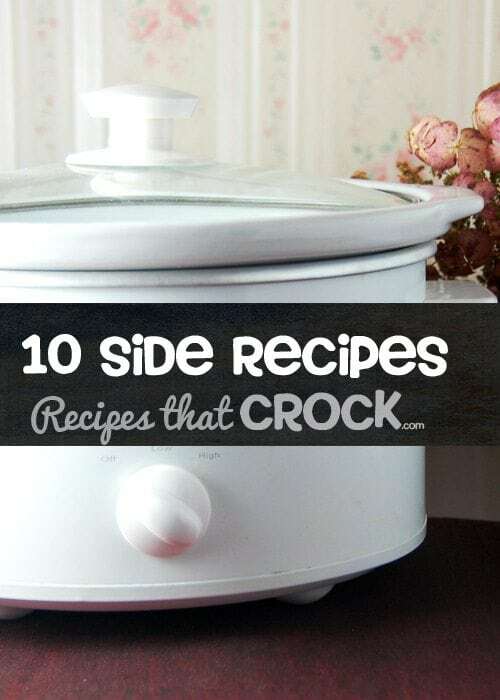 You are here: Home / Recipe Type / Crock Pot / 10 Side Dishes That CROCK! 10 Side Dishes That CROCK! The holidays are a comin’! And that means lots of food to be prepared at the same time. So why not free up your oven with these 10 Side Dishes That CROCK! It is the best of both worlds! You have your favorite side dishes ready when it is time to eat without tying up your oven or stove! We all know the hustle and bustle of Thanksgiving morning or Christmas morning. Everyone is trying to cook all of the must have recipes from the turkey or ham to the famous yeast rolls to macaroni and cheese and all the other favorite sides. The stove and oven are getting their workout for the year. And trying to get the timing down so that everything can be prepared before the natives get too restless is a bit of a challenge. Well, your slow cooker is just about to make all of that a little bit easier! Grab your crock pots and get those side dishes made without tying up that oh so precious stove and oven space! What holiday would be complete without stuffing? This Slow Cooker Chicken Stuffing Casserole is Miss Add approved and a favorite around our house. Or you can add a new favorite with these amazing Crock Pot Teriyaki Mushrooms from Ginger at the Crock Pot Recipe Exchange. Krista will take some stress out of your holiday with these Crock Pot Roasted Potatoes over on Everyday Mom Meals. Aunt Lou usually makes Sweet Potato Casserole for our holiday feasts, but this Crock Pot Sweet Potato Mash Six Sisters’ Stuff looks yummy too! This Broccoli with Toasted Garlic and Hazelnut Crock Pot Recipe from Stephanie at A Year of Slow Cooking is sure to be a family favorite. Or how about this Crock Pot Broccoli Cheese Casserole from Lady Katie at The Crock Pot Ladies. Oh my! Crock Pot Bacon Cheese Potatoes…Melissa from Stockpiling Moms, you had me at bacon! And you can’t forget these Crock Pot Pineapple Baked Beans…yum! Holly from Life In The Lofthouse has my mouth watering with these Crock Pot Creamy Mashed Potatoes. Want to add a lil’ something to your mac ‘n cheese? Try out this Slow Cooker Beefy Mac and Cheese. It makes a great side, but is hearty enough to be main too! Whether you are making a traditional dinner or trying out a new side, your slow cooker has you covered! So free up some space on your stove top and get to cRockin’ the pot!